Are you ready for this?! 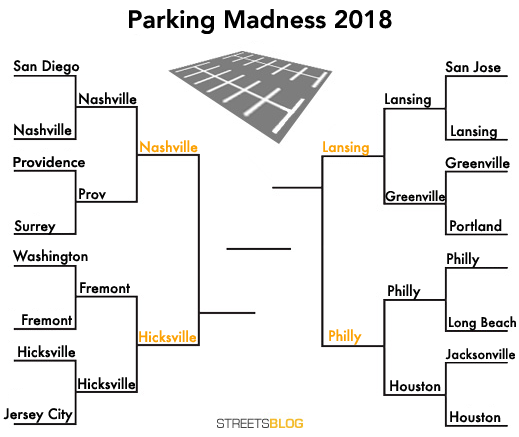 It’s the penultimate match of Parking Madness 2018. Soon you’ll be able put the sad parade of lifeless asphalt deserts behind you, but not quite yet. The most exciting action is still to come: Who will win the Golden Crater™? Who will receive such humiliating notoriety that City Hall may just feel compelled to do something about those greyfields extending as far as the eye can see? Lansing and Philadelphia are still duking it out for the first spot in the championship match. And today, two contenders from Hicksville, New York, and Nashville, Tennessee, are competing to take the other spot. The Hicksville station may be just a 45-minute ride from Manhattan, but the area is simply overwhelmed by parking. Local resident Ryan Coyne, a member of the planning committee for Hicksville’s Downtown Revitalization Initiative, says only about 12 to 13 percent of the 100 or so acres surrounding the station are occupied by buildings. There are some changes on the horizon. With support from the state of New York, Hicksville plans to overhaul the station, change traffic patterns, and make pedestrian upgrades. A centerpiece is a new “festival plaza” for fairs and public events. Hicksville is also receiving $3 million from the state for walking infrastructure near the station, including ADA improvements and better crosswalks. Private developers have plans for some of the lots, which Coyne says will add more than 1,000 residences in total. On West Barclay, bordering the station, a developer is planning a 200-unit mixed-income, mixed-use development. 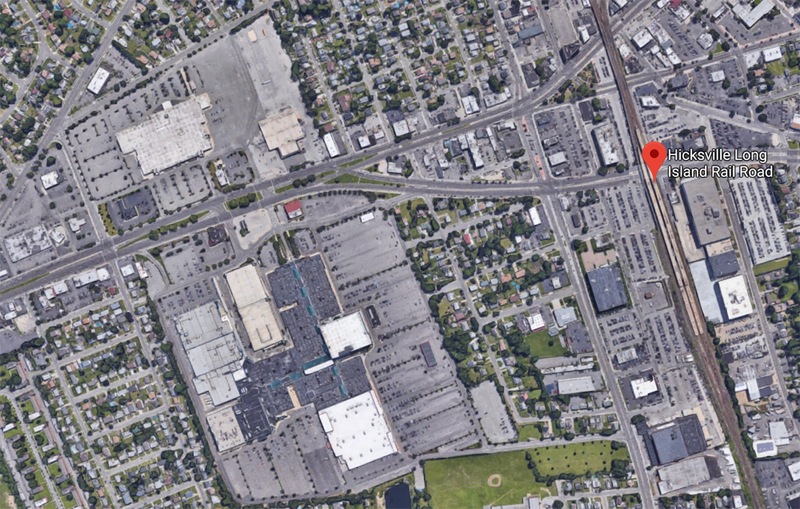 Another developer is planning a 596-unit project on a site that’s been vacated since the closing of a Sears. On the other hand, the MTA is also chipping in public funds to build — you guessed it — parking garages that will add about 700 slots for car storage. Over in middle Tennessee, Nashville is getting ready to vote on a ballot measure next month that raise $5 billion to expand its threadbare transit network. If voters approve it, the effects could be transformative. As this image shows, the city also has to work on its land use if it wants to give people good options besides unrelenting car dependence. 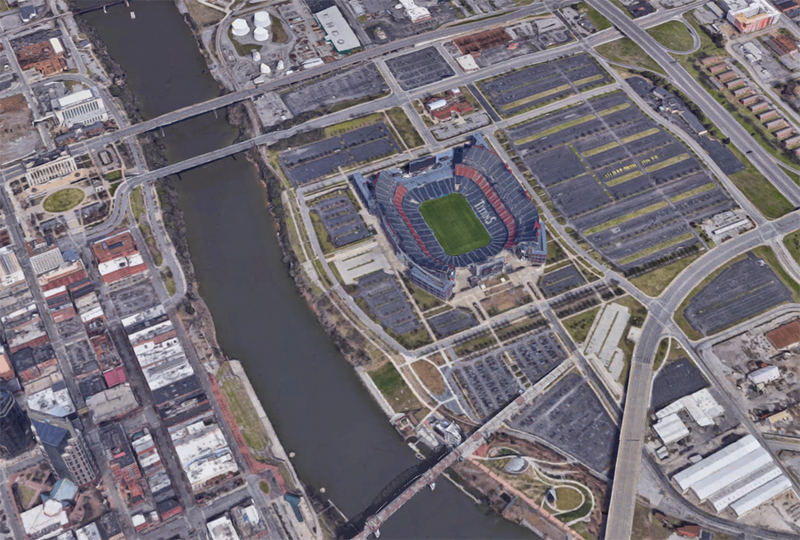 These parking fields, nominated by reader Adam Blair, are for Nissan Stadium. Just across the Cumberland River is downtown Nashville. So this is a real triple threat — a downtown crater, a waterfront crater, and an NFL crater where the spots are only used for a few Sundays a year. 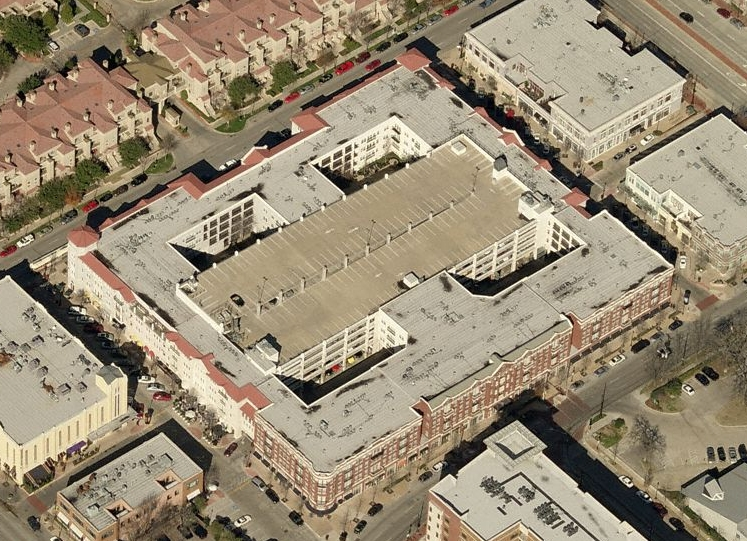 Imagine how much better shape Nashville would be in if this side of the river was a mirror image of the downtown side. A Minneapolis 5 over 2 can accommodate the same parking load as a texas donut without the ridiculous scale. Thus I doubt we’ll see many more of these texas donuts. The parking problem persists though. Sorry guys I just dont know how you can compare a downtown parking crater to one at a commuter rail station in the suburbs.